Since launching Bus Bundle's CPM box and MSO Gold software in early 2009, our customers have used the CPM box for vehicle utilization as a power saving application. The Central Power Management box (CPM) has a built in microcontroller, power electronics, timer, and status indicated LEDs. The CPM box supports 8 to 32 Volts wide range voltage power current. This protects the car battery from a high discharge by powering off the equipment. It also has a Car-Fuse on the CPM box to protect the attached electronic devices from going above the current. 1. CPM monitors temperature with a thermal sensor. If the external temperature exceeds the normal operation temperature of 0 to 40 degrees , the device powers down. 2. CPM Box protects the lifetime and stable operation of the electronic device within the temperature range. 3. CPM box monitors the battery charge level to ensure the battery in the vehicle will not be completely discharged. So in case the engine is not running, the electronic device will not discharge the battery. 4. CPM allows the driver to control the electronic device with a master switch. At any time the system can be powered on or off. 5. CPM box can be integrated with the ignition switch of the engine. This ensures the the electronic device is protected. 6 .CPM box is easy to set up and wire. 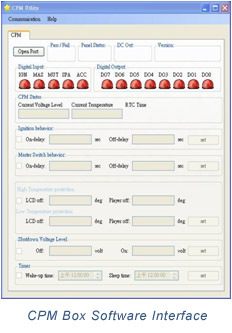 The default setting from the PC using our software can be transferred to CPM box by an RS232 cable before the battery power cables are connected.